Surfside Beach also nicknamed as “The Family Beach” is a small charming town with plenty of family-friendly activities. The beach consists of 10 by 35 blocks stretch, between the Atlantic Ocean and Kings Highway. About 4,000 permanent residents call the town home all year-round, although summertime sees swelling of visitors to Surfside Beach, coming for the quiet and peaceful environment as well as to have some fun in the sun. Surfside Pier is one of the centerpieces of the community around Surfside Beach. The wooden walkway that is built over the ocean offers home to excellent fishing spots, watersports and the popularly known Surfside Diner, that offers an opportunity for the locals and the visitors to share a cup of coffee and breakfast. Tourists and locals also gather to enjoy the sunrise over the vast ocean or even share a nice lunch as they take a break from the hot and sunny beach. The Ocean Boulevard, the main drag through Surfside Beach, blends stylish and contemporary designs with modern beachside activities and amenities. Seafood restaurants, beach bars, beachwear shops and other hangout zones such as Scotty’s Beach Bar and Bubba’s Seafood Shack, surround the intersection between the Ocean Boulevard and Surfside Drive. The majority of accommodations are cottages, beach houses and a limited number of oceanfront hotels, a noticeable difference from other communities of the Grand Strand seaside. This also makes home to less crowded gatherings and an environment that is friendly for a one-day family getaway to Surfside Beach. Fun activities like the daily boat ride that depart from Surfside Beach Pier is also available. The boat rides offer a unique experience for the visitors and locals to go for a short ride out to the sea and enjoy a different view and perspective of Surfside Beach. There are also companies offering water sport activities such as jet skiing, parasailing and even for a crazy boat ride just along the shore. Although Surfside Beach is a popular hangout for professional local surfers, lessons and clinics are also offered to first-time surfers. 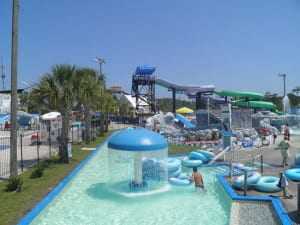 To the south in the neighboring Garden City Beach, there’s the Wild Water & Wheels water park, Myrtle Beach State Park just a few miles north and Waccatee Zoo is located just a few miles in Socastee. Golfers can also share part of the fun in Surfside Beach. One of the popular courses is the Tupelo Bay Golf course, known for its 18 championship holes. On the South Strand, the Mutiny Bay miniature golf course offers fun activities as the only soccer golf course. To enjoy a serious shopping therapy, the Inlet Square Mall is about 5 miles south although Hudson Bay Flea Market offers great bargain deals for shoppers nearby. It won’t hurt taking bite of the excellent seafood cuisine at Surf Cafe, Conch Cafe or the Crabby Mike’s Seafood Buffet. For a more traditional treat, you can visit the American grub at Fat Jack’s Wings & Things or the Dagwood’s Deli. The Island Bar and Sundown Sports are excellent spots to grab some cold drinks, live music and an enjoyable nightlife.